Le Conte Candles are “the world's first visual candles.” As the candle burns, a hidden captivating water color image is revealed. Photo courtesy of Le Conte Candles. The Renaisscent Digital Fragrance Diffuser is controlled through a smartphone app and disperses four scent series. The portable device is waterless, heatless, wireless and rechargeable through a micro-USB cable. Photo courtesy of Renaisscent. Inspired by Netflix’s hit series Stranger Things, Firebox created the Eleven Bleeding Nose Candle after the main character Eleven. The white ceramic holder is a bust of Eleven and comes with two red candles that when lit, turns into a bleeding nose. Photo courtesy of Firebox.com. Trendincite’s Perfumer & Flavorist “Forward Thinking: In The Air,” article, which appeared in December 2014, explored candles and air care activity. Seasonal fragrance directions are still significant in candle and air care launches. However, the latest and most interesting activity is coming from multi-layering and scent control; candle scents translating into fine fragrance; inspiration from pop culture, scent and design; hotel scents; air fresheners made specifically for toilets; subscription services; fragrant devices and smart apps. According to NPDa, home scents contributed to over one-quarter of fragrance gains in 2016, with notable growth coming from diffusers (19%), candles (16%), home ancillaries gift sets (75%), and other home ancillaries (21%). Looking at behavior, NPD’s researchb found that “nearly 50% of all home scent users use home scent ‘to create an inviting/comfortable atmosphere.’ [Additionally], 84% of women use scented home products and are more likely to increase home scent usage when guests are expected, and men do this as well, though to a lesser degree.” The global air freshener market is expected to garner $11.04 billion by 2020, registering a CAGR of 2.8% during the forecast period 2015-2020, according to Allied Market Researchc. According to data from Information Resources Inc. (IRI)d, total U.S. air freshener sales rose 3.2% to $2.7 billion in multi-outlet (supermarkets, drugstores, mass-market retailers, military commissaries and select club and dollar retail chains) for the 52 weeks ending June 12, 2016. Birchwood Pine scent joins Nest’s Liquidless Diffuser home fragrance collection of maintenance-free biodegradable and compostable ScentSticks made from sustainably sourced paper that are infused with fragrance oil. Photo courtesy of Nest Fragrances. In general, fragrances are becoming more sophisticated across categories. With new introductions and seasonal launches, marketers often encourage consumers to own and build a fragrance wardrobe. This applies to home fragrance and Vilhelm Parfumerie Candle’s statement, “With a candle, the room is wearing the fragrance,” is a fitting metaphor. Multi-layering and scent control are the fragrance buzzwords in mass market candles and air care. In 2017, Glade launched the Atmosphere Collection, which is a crafted soy wax candle line that is described as having “multi-layered artisanal fragrances.” The collection is available in four scents: No.1 Enraptured with jasmine, cedarwood, apples and rose petals; No.2 Bright with sweet pea and sun-warmed pear; No.3 Free with beach woods, starfruit and coconut; and No.4 Tempted with patchouli and amber. In August 2017, Glade launched the Glade PlugIns Car fragrance device in four scents: Aqua Exhilaration, Blue Odyssey, Hawaiian Breeze and New Car Feel. The device is designed to plug into a 12V car outlet and works when the car ignition is on. A light glows to indicate it is working and features four settings: low, medium, high and off. The device is said to emit fragrance for up to 60 days and should be refilled when color and scent fade. Air Wick’s Life Scents Room Mists collection is self-described as “the first and only premium range that delivers a multi-layered, true-to-life fragrance, designed to make consumers feel multidimensional scent experiences.” The new mist spray features a more comfortable, user-friendly ergonomic trigger and design. In addition, Air Wick introduced Pure Air Fresheners, which are advertised as “having nine times more fragrance and less water compared to its traditional Air Wick eight ounce aerosols.” The air fresheners contain essential oils such as orange, grapefruit, lemon and lavender to help energize, refresh and relax, as well as eliminate odors. In 2016, Air Wick’s Bloom Scented Oil Warmer launched and was marketed as having eight times more fragrance control than any of its predecessors. Additionally, the device has five settings to enable consumers to control the amount of fragrance delivered. The product earned the 2017 Air Care Product of the Year Award conducted by Kantar TNS. Aesop, the Australian skin care brand, launched a line of three multi-sensory, experiential Aromatique Room Sprays, each with a complete story and a complementary music track composed by Jesse Paris Smith. According to the company, each room spray “is conceived as stimulations to redefine the physical space that surrounds us.” Istros is a mix of florals, smoky tobacco and sandalwood; Cythera contains geranium and incense with patchouli and myrrh, while Olous blends citrus botanicals, cedar and cardamom. 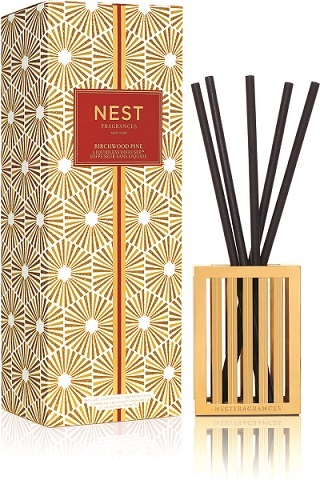 Another notable new product is Nest’s Liquidless Diffusere, a maintenance-free home fragrance product with five biodegradable and compostable ScentSticksf made from sustainably sourced paper and infused with fragrance oil. The ScentSticks are contained in an open-air metal base designed to promote continuous airflow and scent diffusion. Users can adjust the intensity of the fragrance level for the room size by changing the number of sticks used. Each individual scent stick is said to release fragrance for up to 30 days. Holiday and Birchwood Pine are the brand’s newest liquidless diffuser scents. Holiday blends pomegranate, mandarin orange, pine, cloves and cinnamon with a hint of vanilla and amber while Birchwood Pine combines white pine, fir balsam and birchwood over a base of rich musk and amber. Other scents available are: Bamboo, Grapefruit and Moroccan Amber. At one-time, fine fragrances dictated fragrance trends and trickled down into other applications including candles and air fresheners. Now fragrance inspiration can happen in any category and can trickle up or down. Most recently, candles are inspiring new fine fragrance launches. Niche line Byredo has a cult following for the brand’s Bibliothèque candle. In February 2017, the brand debuted a limited edition fine fragrance based on the candle. The scent has notes of peach, plum, peony, violet, musk, patchouli, leather and vanilla. At the end of 2017, Byrd introduced a collection of room sprays in three scents: Bibliothèque, Cotton Poplin and Tree House. In August 2017, the well-known French candle brand Cire Trudon introduced its first perfume collection in five unisex fragrances: Bruma, Olim, II, Revolution and Mortel. According to Julien Pruvost of Maison Trudon, “the creation of a fragrance is similar to the creation of a candle.” In March 2017, Kat Von D announced the launch of Saint + Sinner candles after her discontinued fine fragrances, which will be returning. Saint is a sweet blend of sage, plum, florals, cedarwood, vanilla, and peach, while Sinner features mandarin, cinnamon, patchouli, and musk. Pop culture is both inspirational and a muse for new candles and packaging. In March 2017, to fit in with the ever-popular unicorn trend, Firebox created a Crying Unicorn Candle, which features a white ceramic holder with a rainbow horn candle that when lit, turns into a crying unicorn. In October 2017, inspired by Netflix’s hit series Stranger Things season 2, Firebox created the Eleven Bleeding Nose Candle after the main character Eleven, the young girl with psychokinetic powers whose nose bleeds after she has exerted herself. Similar to the Crying Unicorn Candle, the white ceramic holder is a bust of Eleven and comes with two red candles that when lit, turns into a bleeding nose. For Harry Potter fans, MLC Co. crafted the Sorting Candle, which starts off white and, as it burns, transforms to red, yellow, green or blue, to corresponded to the Hogwarts Houses - Gryffindor, Slytherin, Ravenclaw and Hufflepuff. The candle blends lemon, sandalwood, vanilla and patchouli accords. In June 2017, Ikea and Byredo announced a limited edition home fragrance collaboration expected in 2019 with very few details. According to Ikea’s blog, Ben Gorham, Byredo’s founder, said “I think we’re working on using scent to communicate emotions and tell stories of people, culture and design. It’s a layer we’ve imagined can add a very intimate experience.” In August 2017, Glossier, the hip beauty brand, wrote an open letter to crowdsource fragrance ideas for its new candle. Melissa Souto, Glossier’s product developer, wrote “I’m writing the brief for the fragrance this week and I thought I’d open up the floor for some discussion. What should the Glossier candle smell like?” The company has not announced an official launch date. Odd and intriguing, South Africa’s Michelin-starred chef, author and photographer Jan Hendrik van der Westhuizen created an edible candle made of animal fat. The edible candle is made of kaiings (cracklings), pork lard and pepper. The candle is served with “mosbolletjie” (a South African sweet bread made from fermented grape juice), and once lit, the candle drips onto the bread to be eaten. Art and design is also an inspiration in candles and packaging, and we are seeing a variety of different approaches to new products. In February 2017, Le Conte Candles launched a Kickstarter campaign and achieved their goal in March 2017. Dubbed as “the world’s first visual candle,” the novel candle is unique because as it burns a hidden image is revealed. Le Conte worked with artists in New York to create captivating watercolor images. The candles are hand-poured in small batches, made of soy wax and zinc-free cotton wicks with 10% perfume-grade fragrance oil. Inspired by Bali gardens and temples, luxury jewelry house John Hardy partnered with Joya to create the Sedap Malam candle, which launched in December 2017. The hand-crafted vessel is made from reclaimed clay that looks like John Hardy’s hammered “Palu” technique with a hand-painted 22K gold rim. It can be used as a jewelry bowl once the candle is finished. In the fall of 2017, Liberty London and Anthropologie collaborated on a candle collection using classic English patterns from Liberty prints. The collection showcased three different prints for each candle vessel, which was accompanied by a fragrance. The Strawberry Thief print was designed by William Morris in 1883 and housed a Sparkling Pear scent, while the Wiltshire Berry print was designed in 1939 and contained a Pomegranate Cassis fragrance. The Peacock Orchid print was inspired from archived Liberty artwork and featured a Lemon Leaf Sea Salt scent. In October 2017, Anya Hindmarch, the well-known English handbag designer, ventured into home fragrance with the launch of the Anya Smells, a candle collection in three scents. In collaboration with perfumer Lyn Harris, the fragrances were inspired from three memories and the feelings evoked from each smell. Baby Powder is a soft oriental scent and features bergamot, Italian mandarin and rose petal, violet leaf from France, heliotrope, benjoin Siam, vanilla, tonka bean from Venezuela and musk; Coffee is a dark woody scent that uses notes of café abs, galbanum from Iran, cardamom from India, vetiver, patchouli, Virginia cedarwood, tonka bean, frankincense and amber; and Sun Lotion is a fresh floral scent, which blends Italian bergamot, Tunisian orange flower, angelica seed, cedarwood from Texas, vanilla and musk. In Hindmarch’s irreverent and playful style, the candles are housed in boxes with cartoon-like faces embellished with googly eyes and a variety of words. Each candle container features a sticker graphic label. In January 2017, Maison Francis Kurkdjian collaborated with The Standard Hotels on a city-inspired trio candle collection in New York, Los Angeles and Miami variants. LA is described as “sunny, summery and bright and luminous with a hint of a suntan lotion,” Miami was inspired by the smell of cold sand while being hot outside” and New York was inspired by the High Line because of the greens and plants. To celebrate the Park Hyatt Paris-Vendôme’s 15th anniversary in October 2017, the hotel made subtle renovations. French Perfumer Christophe Laudamiel crafted the 5 Rue de la Paix perfume for the hotel named after the address. The scent is also featured in a shampoo, hair conditioner and cream as the hotel’s guest amenities, but the products are for sale in larger sizes. In November 2017, Sofitel’s hotels debuted Essence de Sofitel created by French perfumer Lucien Ferrero. The fragrance is a fusion of lemon leaf, bergamot, lily of the valley and white sandalwood and is offered as a perfume, candle or room diffuser sold at the hotels and online. Poo-Pourri Smoky Woods features a blend of cedar, hickory and citrus natural essential oils. Photo courtesy of Poo-Pourri. Air fresheners that are specifically formulated for toilets and bathroom odors are emerging. The category lends itself to kitsch potty humor in branding and marketing. 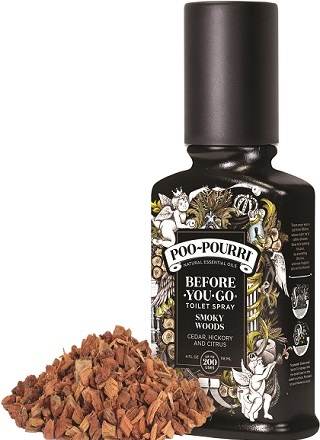 Poo-Pourri pioneered the segment and was introduced in 2007. In 2013, the brand became known for its cheeky online commercials. According to a January 26, 2016, CNBC articleg, 17 million bottles of Poo-Pourri have been sold since 2007 with annual sales reaching over $30 million. In the summer of 2017, Poo-Pourri launched Ship Happens, which highlights coconut, freesia and citrus natural essential oils. In the fall of 2017, Smoky Woods launched and features a blend of cedar, hickory and citrus natural essential oils. Blue Q carries a variety of kitsch lavatory mists in juvenile names. In 2017, the brand added several new scents to its collection. Brave Fart Lavatory Mist contains cedarwood and mandarin, while Shitting Glitter Magical Unicorn Lavatory Mist has lavender and basil and Uranus Lavatory Mist features Meyer lemon, bergamot and rose. At the end of 2016, Squatty Potty, the company known for its Squatty Pottyh toilet stool, launched a line of toilet sprays as the company’s first brand extension. The Squatty Potty Unicorn Gold “before-you-squat” poo sprays use gold nanoparticles and are available in five scents: Citrus Squeeze - Orange & Lemon; Fruity Booty - Cherry & Mixed Berry; Mystic Forest - Bergamot & Bay Leaf; Pinch of Vanilla - Vanilla & Tonka Bean; and Tropical Dropsicle - Coconut & Magnolia. Air Wick’s V.I. Poo is the newest mass brand with a “before you go” tagline offered in four scents: Fruity Pin-Up, Rosy Starlet, Lavender Superstar and Lemon Idol. Inspired by other market segments, subscription box services and customized candles are now available. Scent is a candle subscription website that “hand selects high-quality candles based on a users ‘scent profile’ and delivers them based on their desired frequency.” For $65, consumers can choose to receive a candle monthly, every other month, or quarterly. Similarly, Wickbox luxury candle subscription sends a curated monthly candle delivery based on your unique scent preferences. Vellabox’s tagline is “Artisan candles delivered monthly” and the company focuses on a candle subscription service that delivers “health conscious candles,” which are handpicked, non-toxic, lead-free and hand poured. Tish Cyrus and Nicole Winnaman have joined forces to launch Original Scent Home Fragrance. The duo, aka “Tish and Nikki,” have unveiled their “scent concierge service,” where your home fragrance can be customized to match your individual style and personality. The online boutique offers a choice of a box pattern, signature fragrance and personalized label. At the end of December 2017, Otherland launched an online high-end candle business to sell direct to consumers similar to the Warby Parker model. The core collection features five eight-ounce candles that use a custom soy and coconut wax blend and cost $36 each or $89 for a three-pack with shipping included. The five scents, designed by Firmenich, include: Canopy (fig/ivy greens/fresh), Chandelier (champagne /saffron /leather), Daybed (rosebud/peonies/floral), Kindling (wood/clove/smoky) and Rattan (sandalwood/amber/earthy). Home-scenting devices are becoming more sophisticated with programmable and portable products. In May 2015, Sensorwake launched a Kickstarter campaign with partner and investor Givaudan. In 2016, the companies debuted the olfactory alarm-clock that gradually awakens individuals with scents. In September 2017, Sensorwake renamed its company Bescent. Additionally, the French start-up company announced a new generation of its alarm clock: the Sensorwake 2 with new functions and an expanded range of scented capsules. The Sensorwake 2 currently offers its best-seller Peppermint fragrance capsule as well as Chocolate, Cut Grass, Edge of the Woods, Espresso and Seaside scents. The company is working on additional fragrance capsules including Apple Cinnamon, Biscuit, Orange Juice, Summer Melon and Tea Tree. Germany and Japan will have two exclusive fragrance capsules: Yuzu and Sakura. Bescent also partnered with the Lexibook Group, a European leader in electronic products, to create a children’s Sensorwake alarm-clock. On September 1, 2017, at the IFA consumer electronics and home appliances show in Berlin—using licenses for Frozen (Disney) and Minions (Universal)—Bescent unveiled two exclusive Sensorwake alarm-clocks. The Olaf kids alarm clock includes one Mint capsule, while the Minions kids alarm clock includes one Banana capsule and both are applicable for up to 30 awakenings. Strawberry Candy and Sweet Peach are additional fragrance capsules offered. 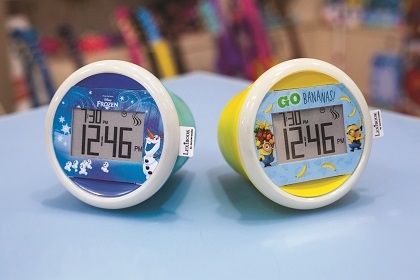 Bescent and the Lexibook Group’s Sensorwake kids alarm-clocks feature a Mint fragrance capsule for Olaf and a Banana fragrance capsule for the Minions, both are applicable for up to 30 awakenings. Photo courtesy of Bescent. Aera by Prolitec is an app-controlled system that features a sleek exterior with a circular nodule on one end for the adjustable fragrance capsules. There are six different fragrances that range from a spicy oriental to a crisp citrus and each capsule is said to last for up to 60 days or about 1,400 hours. Éverie from France is a programmable and portable Scent Interior, which was designed as a decorative object. The system contains sixteen perfume compositions in compact capsules, which can be used à la carte and recycled. For the holiday season, from November 9, 2017 to January 3, 2018, Yankee Candle opened CandlePower, its first experiential pop-up shop, in New York City’s SoHo neighborhood. The 5340 square foot store featured ten immersive, interactive and multi-sensory exhibits that engaged all five senses. For example, Yankee Sun Drenched Apricot Rose scented a multidimensional floral display, while Yankee Sun & Sand was used to create a tropical vacation and WoodWick Fireside enhanced the sound of a crackling fireplace in a cabin getaway. The space also featured a Scent Test Bar for shoppers to explore fragrances based on personality types as well as a personalization lab for shoppers to customize their own Yankee candles by selecting a candle style, fragrance and personal photo for the label. Products connected to smartphones and apps are making their way into candles and air care. The LuDela Smart Candle allows users to ignite and extinguish a real flame from one’s smartphone. It also enables users to control the amount of time a candle is on with a timer. As a safety feature, the candles have sensors that will extinguish the flame if the candle is knocked over or if it senses something above the flame. The Moodo is controlled by a smartphone app and utilizes the “single serve” concept similar to coffee makers. It includes a basic starter pack with four fragrance capsules that are said to last for two months with daily use. Users can adjust the four scent levels or use the Moodo presets. There are six scents available such as Beach Party, inspired by the sea using notes of amber and salt, and Oriental Delights, a floriental combination of rose, jasmine sambac and sandalwood. The Renaisscent Digital Fragrance Diffuser is a new entrant, which launched on October 18, 2017 on IndieGoGo. The device disperses four scent series: Attractive Sensuality, Cosmopolitan Cities, Oriental Meditation and Relaxation, which is controlled through a smartphone app. The fragrances are packaged in capsules, and each fragrance capsule comes with three different aromas for a total of twelve options, which can be customized to mix and match. The device is waterless, heatless, portable, wireless and rechargeable through a micro-USB cable. Fragrance is integral in candles and air care. It is a given that consumers will continue to expect and demand new seasonal scents. Multi-layering fragrances and scent control will remain marketing buzzwords. Ambient scenting and malodor coverage are two different, yet significant directions engrained in air care. These standard categories will continue to be explored through many avenues across markets. As brands look to expand their presence, they will venture into other categories related or unrelated to their core competences as new entry points. There are a variety of stimuli for sources of inspiration for new olfactive directions, emerging ingredients and package design. Pop culture and art and design are always inspirational and will continue to act as a muse for new candles and air care product launches. Watch as designers collaborate to create innovative new products with aesthetic packaging and interactive, engaging and multi-sensory stories. Technology is a driving force in all industries and services. It will impact how users experience fragrance. There is no doubt that there will be more activity in candle and home fragrance subscription services, customization, fragrant devices and smartphone apps. All of these developments will continue to drive new product innovation and create opportunities and challenges for manufacturers and fragrance suppliers in the scented air care space. hSquatty Potty is a registered tradename of Squatty Potty LLC.